Private Beach Yoga Session: recommended for sunset (4:45pm-5:45pm), an hour session that truly slows you down and connects you with the nature of Costa Rica on one of the most pristine beaches in the world. The beach is know as one of the best place to meditate -where the earth meets the sea- reconnecting with the vibration of our planet. 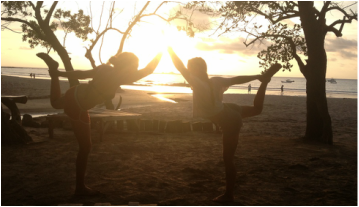 Tamarindo sunsets are famous and what better way to enjoy them than experiencing yoga. This session is one-on-one in a semi-private area of the instructors expert selection and includes aromatherapy with therapeutic essential oils. Partners Beach Yoga Session: recommend for sunset (4:45-5:45pm), partner or couple's yoga is our most popular offering. It is a relaxing, fun and interactive session to connect with nature and to feel how amazing the support of another leads to deepened surrender and opening into the postures. The hour partners yoga session offers many benefits, including a shared one of a kind memorable experience. The unique sequence is amazingly beautiful. Private Yoga at your Vacation Rental: mats, props, aromatherapy and your own personal bilingual yoga instructor at your door step.